Simply click here to sign-up or you can use the registration form that is displayed below – It’s FREE! Receive useful news and updates directly to your email inbox. Alternatively get our RSS Feed if you prefer. Let us know about any relevant useful items or resources or developments that could be posted in our newsletter. Take a look at our recent and archived news items. 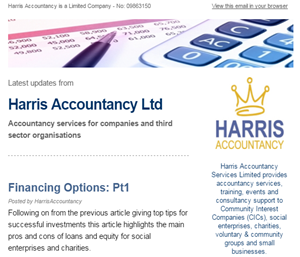 Harris Accountancy Services is a community interest company that provides accountancy services and support to charities, voluntary & community groups, social enterprises and small businesses.